Could have been the perfect datsun, if it were real. anyway... do you think we can actually add the kit to a b210 like that? yes, here in malaysia the government is very unfair. in order to let proton, and perodua(malaysian made car) to survive in the industry, they charges the tax imported car very expensively! sometimes it's up to 300% of the cost of the car. for example if a car would cost RM50k, it would be charged 300% and sold at RM200k! that is why malaysian only able to buy local made cars! but nowadays several other companies are collaborating with malaysian car production companies which is producing cheaper cars. e.g: hyundai has collaborated with Inokom(malaysia) producing some car which will reduce some tax or wadsoever making the car sold cheaper here in malaysia. A14force: eer.. wad is concour? i see you own a 120Y as well huh..
Dodgeman: i dun think i can manage to turn this dream of mine into a reality! it's expensive to produce a custom made body kit! and i'm still a student which my mom is paying for the patrol! yet, i showed this pic to my mom and she said she would definately NEVER drive a car like that! kekek..
dattodevil: i like the truck that you have! i think it looks very sporty! anyway in malaysia, we are not allowed to own a truck like that! we must register the truck under a company's name. and i dunno why! few years ago around 2001, my datsun was handed over to a stupid cousin of mine! and he'd used my datsun for 2 years. during that time he had a bad accident! my datsun was crushed into a perodua kancil real hard. the damage to my datsun is 2 broken lamp! twisted bumper(which was then twisted back in shape), 2 front signals + small lamps were damaged. the damage to the perodua kancil is: broken windshield, damaged 1/3 of the car, and blown engine!!!! that makes me know how solid my car is!!haha.. yes.. my datsun was edited by computer, and there are actually nothing in my datsun, it was the purely original 1974 Datsun120Y (except for the engine, i modified the engine to a nissan i dunno wad model engine that is which is 1500CC)!!! 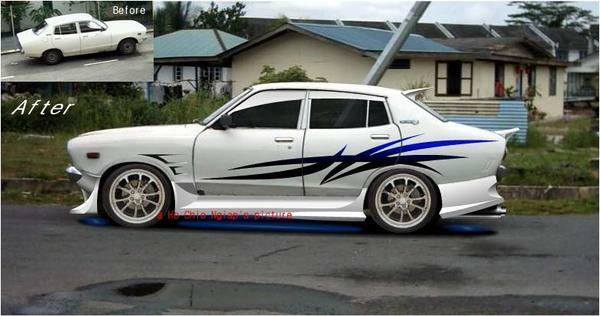 no neon, no skirt, no nothing, and it's just a prototype which i wish i can do it to my Datsun!!! Driving Datsun is an embarassing thing in my country, most ppl in malaysia look down on ppl driving an old car.. but i dun care how they look at me as long as i had a solid powerful car with me :)..
about different color of skirt and body.. a lot of malaysian love to paint thier skirt different color with thier body color, due to 2 reasons: 1. they love painting their car that way, 2. they are out of money for painting the car's skirt ..so they dont paint the skirt.. hahaha..
tsunami didn't hit my area coz i'm from east malaysia, which is located at borneo island! tsunami hit west malaysia. and i think there are 66 death in my country due to tsunami. when i was a kid around 4-5 years old, i remember once i was in my Datsun looking out the window, and suddenly .. there are 7-8 datsun driving through .. horning at us wanting us to follow (which i think it was a Datsun fan club), but now, ... i think the club was history in my town.. i don see much datsun around anymore .. kekeke.. I don't know how well you speak the language, but you write it MUCH BETTER than some of the locals [who should know better] on this site. I too think its a great concept, now all it needs is to be turned into reality. Everyone drove Protons (manufactured locally) or Peroduas (spelling?) which were in some way affiliated with Diahatsu? Did the tsunami hit your area? but either way, alot of effort has gone into it! but yeah sweet car.. whats it got in it??? yup, and the muffler just looks fake - lighting's wrong or something... plus it would almost have to be right under the leaf spring. shadow under the car is unrealistic (placement and shape) and too dark.